Tell explores the story of Reena Virk, a South Asian adolescent girl who, in 1997, was assaulted and murdered by a group of her peers in Saanich, British Columbia. 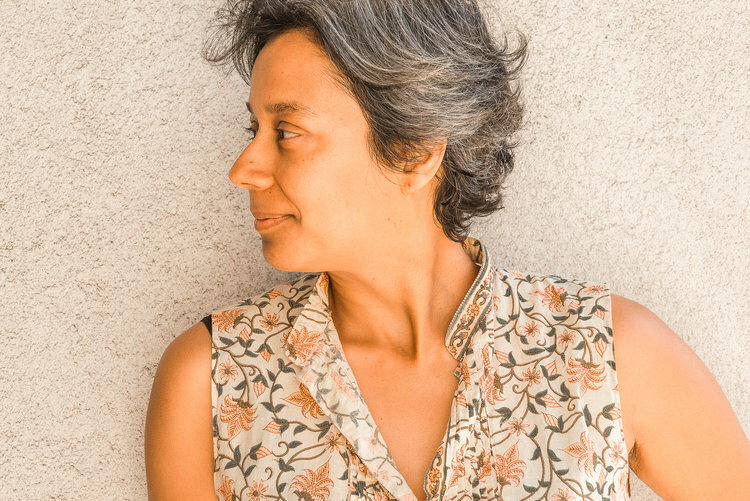 Canthius publisher Cira Nickel interviewed Soraya on poetry's unique ability to portray Reena's story and the circumstances surrounding her death. Canthius: Reena’s story has been widely distributed by mainstream media. You were initially planning to write a play about Reena’s murder and the trials that ensued. Why did you settle on poetry as the vehicle to tell her story? What insights or truths can poetry shed on a traumatic event that other forms of media cannot? Soraya: I turned to poetry simply because it was the instinct that was becoming most clear. The story of Reena Virk was still being unravelled when I began writing; the possibility of mistrial, acquittal – even, very faintly, Kelly’s innocence – was always present. And still, there was a larger, energetic field beneath the question of verdict. I love the way poetry has the capacity to hold questions that can’t be answered; to maintain their unanswerability as active, expressive, generative. The way silence, the isolation of language from its intent, can open towards a multiplicity of meanings. Jane Hirshfield calls this “the mind of indirection” – the way poetry does not move directly to knowing; that it can move alongside not knowing, alongside wanting to know, the mind listening to what it wants from knowing. Ultimately I am not adept at playwriting, but I can imagine that in the hands of better performance artists Tell could have taken shape in a way I would have loved – embodied, choral, architectural. An early attempt, devised in collaboration with the director and the performers, included human and non-human voices – a star, a Garry oak tree, and a fluorescent-lit telephone booth as characters. The Gorge was played by a puppet made of cloth, which poured ribbons of white gauze from its mouth (created by Indian dance performer Gitanjali Kolanad). I wholly believe Tell could have been, could still be, choreography; an opera. Soraya: I had great resistance to holding my own adolescence in relation to Reena’s – I felt like what I experienced was so ordinary, casual, nothing at all. I did not want to suggest that “it could have been me:” maybe it could have – but I can make a very good guess as to why it wasn’t; I could just as easily been one of her assailants. In the end, I recognized that without this section, the work would be dishonest. I think we need to say who we are, when we claim the position of “witness.” Placing myself in the narrative is in part an attempt to say why so many of us, as brown girls, related to Reena; how we can trace what she was as subject back to the most common of our experiences. I wanted to counter the extravagant surprise that was expressed at Reena’s murder, and say, we know this, intimately. And at the same time it’s a recognition that Reena transgressed in ways I never would have had, would never have needed to, with my middle-class upbringing. It’s an attempt to reach across a chasm of experience; I borrowed much from Reena’s life and death, and I wanted to give something back. I didn’t want to fictionalize Reena – I felt that wasn’t my right. But the testimony stripped her of a human and social identity; most often, she was seen and spoken of as a body that was subject to violence, then the violence of invisibility, then the violence of forensic examination. I needed some way of bringing forward a living body, a body that was trying to survive, a body that was asserting its right to be here. Canthius: Unlike linear, prosaic tellings of Reena’s murder, Tell’s use of language opens up her story, revealing and complicating the factors surrounding her death. It does so in defiance of the mystery, the silences, the unanswered questions about how and why she was killed. Can you speak to how your word choices challenge the silences and questions and breathe life and nuance into Reena’s story? Perhaps you can speak specifically about “Gorge Waterway,” a poem that features words with at least more than one meaning. What is are the significances of these words as they appear in the poem? Soraya: I found etymologies and translations acted as portals for me in the writing. Even from “Saanich” itself, the name of the suburb where the events took place, where Reena was drowned: in its original Salish tongue, the word means “to emerge, as from water.” That word relocated me – not in Victoria, but in the ancestral land of the Songhees; not simply within a narrative of racism but also one of settler colonialism, of which I am a part. The relationship between “Gorge” and “throat” unfolded out of the trials’ concern with Reena’s throat as the site of the most extreme acts of violence, and as the repository of the evidence that she had drowned – and was not beaten to death. Ultimately, her throat is the site of the trials’ central question – who drowned her. It is both an essential question, and an evasion of the fact that the event began as a collective assault. “Gorge” was a word that opened into French as my mother tongue and my own girlhood – I could almost hear the word in my mother’s voice. English lacked this texture; there were feelings that were inexpressible to me until I found them in French. The sound of the word has a whole other quality of feeling in French, a whole other quality of resistance; it is more raw. “Gorge” was one of those given words that was continuously generative – phrases like “faire des gorges chaudes,” which suggested the scorn they held for her, but which also returned you to the imagery of the the interior body. There is an Indian martial art form called kalaripayyat; its central principle is, The body is all eyes. I felt as though the words were all eyes: they looked in many directions at once. Even words taken from the testimony: “boggy,” which was used to describe the condition of Reena’s skull under the pathologist’s hands, and which also turned to the marshland ecology where she died. Canthius: Tell’s first section, “Search,” provides a detailed description of Reena’s body and the area where it was discovered. The opening poems depict the deceased Reena as almost integral to the place where she died. Natural elements--silt, water, reeds--disguise her identity; the poem “Willow” describes her as a “small, darker object.” In “Autopsy” we learn that, even after the body was washed, her dark skin hides her injuries and any obvious evidence of water immersion. Why did you depict Reena’s body as integral to the site of her death and why does her body and the landscape where she died simultaneously reveal and conceal the crimes done against her? Soraya: For me, the sense of integrity emerges from the sense that the Gorge held her – in processes of ecology, tides, currents; in processes of decay. They are processes that may be seen as frightening and unnatural, but they can also be seen as separate from the violence of her death, as natural and full of dignity. It is a sense that her body was at least allowed to be at rest. More and more I am considering the reciprocity between colonial violence as experienced by the body and as experienced by landscape; in Reena’s case, by a girl’s body and a body of water. The deterioration of the Gorge is connected to processes of settlement, and the violence done to Indigenous peoples here, their culture and ecology, their relationship of care towards the estuary and eelgrass meadows. There is a real, geologic sense for me that the earth remembers, records such trauma. I was struck by the defense’s suggestion that Reena’s dark skin and body hair made the nature of her injuries, and therefore their cause, difficult to ascertain. So even the process of autopsy was racialized. The unwillingness to see the degradation of the Gorge has parallels in the unwillingness to see Reena’s injuries. What is the relationship between the defense’s argument and the racism Reena experienced when she was alive, taunted for being brown, big-bodied, hirsute, ungirl-like? If we were willing to see how a brown body bruises, what would we see? Canthius: Further to my previous question, I’d like to ask you about the following passage from “Tillicum Bridge," a poem belonging to Tell’s final section, "The Landscape without Her:"
Tell depicts and challenges the tension, the dichotomy between telling and untelling, revealing and concealing. Can you explain why it was so important for you to highlight and subvert this tension? Soraya: One element that I never could write into a poem was a statement by Christie Blatchford, who covered the trials for the National Post. The Post and other media at one point requested the release of the autopsy photographs, against the wishes of the family. In her supporting statement, Blatchford said that she needed to see them “so I can know who to hate and by how much.” It’s hard not to be astounded by that statement; to wonder what, exactly, that calculation would be. I think that the Reena Virk trials were not simply about convicting the young people involved in Reena’s death; they were also about writing a narrative that we could live with; that would turn a young white girl like Kelly Ellard into an aberration, and leave us clean. There was a collective anxiety at the possibility of a racial murder by youth and particularly young white girls in Canada. And yet, we can trace racism, sexism, and feminine heteronormativity, beyond Reena’s death; by the fact that the police didn’t search for her body for eight days; that it was assumed she was a troublesome brown girl who’d run away; that the cigarette extinguished on her forehead, where a bindi might have been, was not considered an act of hate; that it took three trials to convict Kelly Ellard. And those trials were devastating, not only for the memory of Reena Virk, but for the young people themselves, their sense of self. The process divorced remembering from reconciliation; it took from young people their own language, and placed in their mouths the language of procedure, the jargon of anger management. Really at the heart of Tell is the trial of the story. Or, the autopsy of the story. The trial, even as it seeks justice, is also a kind of violence. Part of the underlying question of Tell, for me, is what would be a truly just process? What would be a process that would allow restoration? for throat, for a stone that adorns the throat. In the passage above, the site of Reena’s death, the gorge, gives way to something “gorgeous.” Can poetry beautify and transform tragedy and bring about renewal and healing? Soraya: I don’t know that it can, always. I don’t know that I want it to. My intent wasn’t to beautify an untimely death, the cruelty of it. For me poetry is a state of seeing and tending to experiences, without flinching, regardless of whether they are wanted or unwanted. I think what readers experience as beauty in the poems is simply concentration. I didn’t want to use lyricism as sentiment. At the same time, I am conscious that bodies like Reena’s – bodies of colour, androgynous bodies, ungainly – are often denied lyricism; that our language is engrained with a denial of their beauty and belovedness. I searched for a lyricism that was not hierarchical, that could hold what is said to be ugly; what we don’t want to see. That extended to the violence that her body was subject to. There is no healing for Reena; I can’t say anything about those who loved her. But poetry can at least affirm presence, endurance, undeniability. Canthius: In an interview with Phoebe Wang for The Rusty Toque, you listed Carolyn Forché, Marlene NourbeSe Philip and Sachiko Murakami as poets who have inspired your work. How is Tell in conversation with poems/books by these authors? Soraya: Forché’s writing introduced me to an estranged lyricism that I remain deeply drawn to; I also valued her anthology Against Forgetting for its vision of “poetry of witness” and the encounter with writers in translation, particularly Arab and Asian writers. But I also needed to read Indigenous writers and writers of colour in Canada to see how lyricism is affected by the pressures of race, of histories of colonialism that the dominant culture won’t acknowledge. I needed writers working against our own forgetting, the urgency of that project and how it shapes a poetic voice. Marilyn Dumont’s A Really Good Brown Girl and Green Girl Dreams Mountains have been touchstones since I began writing, and helped me through the autobiographical poems in “Who You were” – reminding me to be true, to be brave, to say what needs to be said. But Marlene NourbeSe Philip’s Zong! and Sachiko Murakami’s The Invisibility Exhibit also taught me strategies beyond autobiography, in projects which, like Tell, are concerned with white violence, trauma, and law. They helped me understand the source of the strangeness that I so love in poetry; the exposed nervous system between interior and exterior imagery; the relentlessness of what haunts them, its intrusiveness on daily thinking and experiences. I read Zong! just as the first inklings of Tell were beginning to take shape. I hadn’t found the title, then, but I can see it reflected in Philip’s concern with “that cannot be told…[but ] that must tell itself.” I recognize that my own work doesn’t venture as far in its formal experiments as do these books, but I paid attention to the way both Philip and Murakami dismantled colonial narrative to see its scaffolding. Canthius: Finally, I’d like to know about Tell’s cover art by Karine Guyon. How did you arrive at this choice for the book’s cover? How does the cover art speak to the book’s themes and content? Soraya: Beth Follett (editor of Pedlar Press) found the image, originally an oil on board painting called "There is Light". I let her lead the search; my only request was that we not use an image of Reena Virk herself – again, I did not want to suggest that this was “her” story, a “true” story. Beth and I both had an immediate and visceral response to Guyon’s painting; it had huge energy, alive and raw. It suggested to me something of the Gorge’s whirlpool, the reversing falls of the estuary, the site of the myth of Camosun; and something, too, of my own obsession. And it was wholly its own being. I researched Guyon’s work after Beth sent me the image, and these are the words I found in her artistic statement: “During [the] process, I use a cyclical…technique of composition and decomposition…layering and scraping away of paint, using various sharp tools and energetic gestures…occasionally cutting the entire work into smaller pieces until I feel it cannot be further decomposed. In this process of creation and destruction, I reveal to the viewers my intentional exploration of decay as a marker for the passing of time, the evidence of beauty, the abuse and the intemperate nature of life.” This so exactly mirrored what I felt the process of writing Tell had been. That is when I said yes. For further reading on Tell, check out interviews by Phoebe Wang from The Rusty Toque and Julia Horel from All Lit Up. Also read Tanis MacDonald’s review of on CWILA’s website and Sonnet L’Abbé’s review in The Walrus.